Great,good to hear. One last question reagarding your engine bay, what engine dress up bolts do you have? oh originally I did the engine bay in stainless bolts from the company called Dress Up Bolts, but recently I bought 8 Mugen license plate bolts and I put five along the front bumper plate, 2 on the radiator holder plates, and one last one on the cruise control box. Most of the ones you see in that picture are the Mugen bolts. Expensive option but I like the unique look of them. Pretty positive that isn't one of Spoon's cars but a look-alike car, not that it matters. LMAO, thanks for the kind words, they look better in person, that picture isn't totally clear, I do like them as accents to the engine bay. Your ASM Bar is looking great, take care of it. I am ordering mine soon, and Going to line my ASM Radiator Shroud with ASM License plate screws like you did with the mugen. Thanks, I really love the ASM bar, it seems to be working nicely too. The ASM bolts look cool from what I could see on GoTuning's website, please post up pics I'd love to see them installed. The engraved lettering on the bolts seems larger than the Mugen, which I like. At twice the price of Mugen bolts I think those should be classified as baller !, lol. 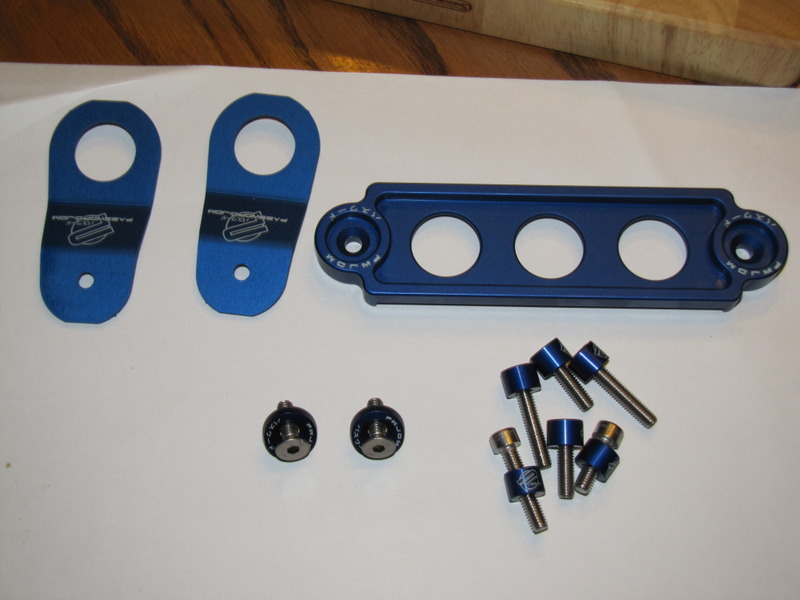 I just got some cool bolts from PasswordJDM today, stainless bolts with anodized cups, the are designed to be used on the Vtec solenoid, I thought I'd give them a try, kind of neat looking bolts too. a $850 ASM stainless strut bar is truly baller. Yea i like the ones you got!! I've had at least 5 strut bars on this car, realizing they are only for cosmetics and being able to rest your arm on something while wrenching in the engine bay. But I have to say the ASM bar is the only bar where I felt a difference after installation. The lower X support ties into the steering rack/subframe, and it is a fully welded X support unlike some of the slip fit replica versions out there. It definitely stiffened things up IMO, or at the very least transmitting extra steering feel, something is different that's for sure, so I do like it. Replacement for stock airbox filter, which one? any good thoughts on j's racing intake?